The taste of shaved ice mixed with your favourite flavours surely brings back childhood memories. Be it on frozen treats or cocktails, shaved ice is needed in every way. However, to shave the ice with a mechanical shaver can be really hard and a painful job. Well, there is a solution to this problem. 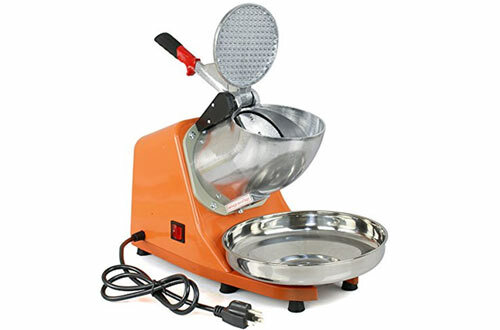 All you need to do is to opt for the commercial electric ice crushers. 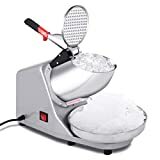 An ice shaver that runs on electricity produces a lot of crushed ice within the minimum time. With a lot of capacity and finest texture, you are at the receiving end of the best results. And they are highly user-friendly too. Want to know more about the electric ice shavers? 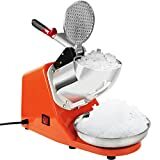 Decipher the features of the products in our list of best electric ice crushers for home use or commercial use and update your knowledge for selecting the best one for yourself. You can entertain each and every guest with this ice crusher. 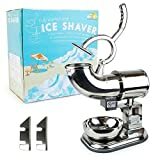 For kids it will churn out shaved ice for ice cones and adults can enjoy a refreshing cocktail. The steel finish and solid build quality along with the sleek design make it an excellent product. 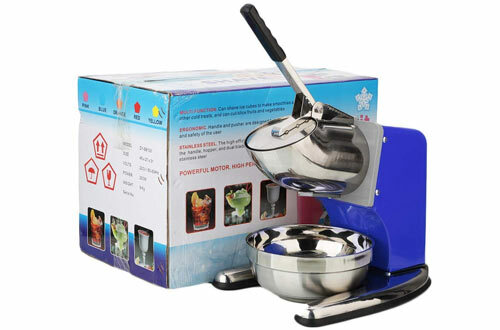 It is an automatic machine which means you don’t need to pour labour for enjoying the shaved ice. Just plug and press button that is to waterproof to suit your needs. Plus, the stainless steel blades are rust-resistant thus extremely hygienic. Shaves more than 140 pounds of ice each hour. Sturdy base to offer stability. Weighs a mere 11 pounds. Zeny has made an electric ice shaver machine that is made from top quality materials and is durable enough to last you for a very long time. 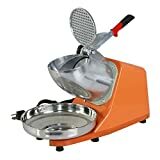 It has a steel base constructed of heavy iron casting and with the rubber pads at the bottom, it adds handsomely to the stability of the overall machine. The body is crafted from lighter aluminium and you are not limited to a specific shape of ice while using it. You can shave all kinds of ice if it fits the size of the hopper. Being a waterproof machine, the blade used for shaving is made of steel and is of commercial grade. Consumes just 300W of power and works at 110V. Runs 1400 times per minute. 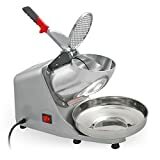 This ice shaver is an excellent choice for a party since it shaves an enormous amount of 143 pounds at only an hour and can easily stretch continuous work till 20 hours. Even ice cream parlours would be making a huge profit with this machine. The safety cover on this one is another marvel to look at. With less noise as well as vibration, one can experience silent operation and also better stability. Numerous outlets at the bottom to dissipate heat. Easy to operate with a humanized design. 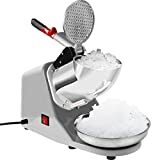 You can make refreshing and energising slushies or frozen drinks and delicacies with the powerful 300W electric ice crusher shaver from Zeny. It has a shaving blade which is crafted from a grade of steel used for commercial purpose. Also, the shaver has perfect rust resisting capabilities and can efficiently shave-off ice. The stainless steel bowl is base heavy for maintaining stability and clean up is a breeze. Very lightweight, just under 12 pounds. Has a safety feature that shuts down the machine when the cover is open. The sleek shape appeals to one’s eyes. A very robust design along with high strength and durability are perfectly crafted into this commercial electric ice crusher. Its unique commercial design manages to grab a lot of eyeballs since it stands out from most of the products manufactured by the competition. Apart from these, the two stainless steel knives design crushes ice with tremendous efficiency and can churn out 220 pounds of it every hour. Along with the cover that safeguards the ice from splashing out, you get two options i.e. thin and thick ice for shaving. To avoid short-circuiting or other such accidents the switch sits inside a waterproof cover. Warranty of a full year. The F2C has an impressive build quality and its blades special alloy construction is made to last you through extended periods of time. Also, the blades and motor spin at fast speeds that might cause a lot of vibration. 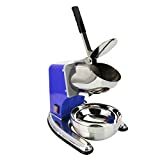 To keep your machine in a stable condition a heavy-base has been used while rest of the body is constructed of anodized aluminium alloy to keep overall weight in check. You don’t need to worry about rusting either since all parts that come in contact with ice have an alloy construction to resist that phenomenon. The cover handle and few other parts have an orange highlight. Plastic base plate quickly dissipates heat. The shape of ice does not matter if it fits. 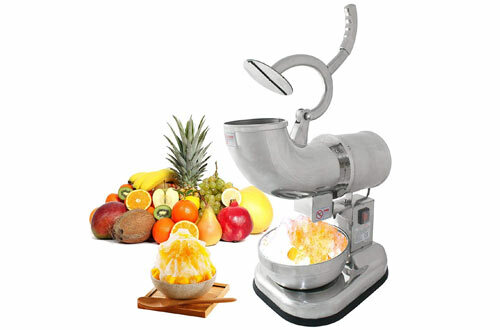 This machine is great for a business owner or people who like to throw big parties. It will grab your interest with the tubular and dazzling shiny structure that is completely different from the products available in the market. The motor is high output which gives you a lot more for a lot less power. Moreover, its blades are so powerful that it can not only give you ice that has a texture like snow but also shaves fruits. Your cocktail party got a whole lot easier. The dual blades are removable. Most of the parts are forged of steel. Precautionary measures like waterproof protection of the switch. 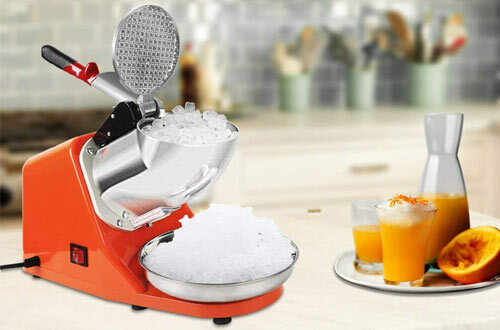 With this Vivohome electric ice crusher machine, the manufacturer has greatly emphasized on all of the safety features while retaining other top-notch ice crushing features. 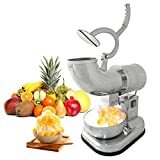 Having a stainless steel bowl that is also of food-grade, even the blades feature the same construction and have a motor that will meet all your demands. For your convenience, the base is equipped with 6 anti-slip rings made of rubber to keep the machine at a firm position. With the power cut, the blades are designed to stop rotating immediately. No noise or vibration is produced. For those who are looking to make some ice with ice crushers. Zeny has created this machine that stands up to rigorous commercial use. 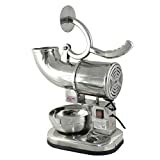 It churns out an incredulous quantity of 440 pounds of crushed snowy ice and requires a mere 250 W of power. You absolutely cannot miss this great product as it is both efficient and energy-saving. You can add or condensed milk with the ice without any problem. 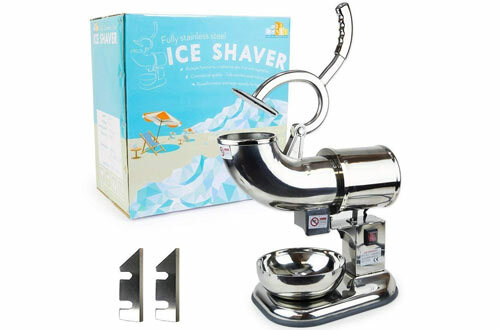 All the great qualities of a high-end and flawless product are present in this ice shaver. It is armed with safety features such as water-resistant switch and has an intuitive design that allows anyone and everyone in your home to be able to operate it. 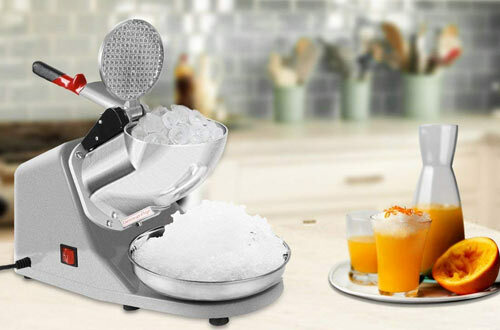 Get a heavy amount of ice in a very short time with this electric ice crusher. 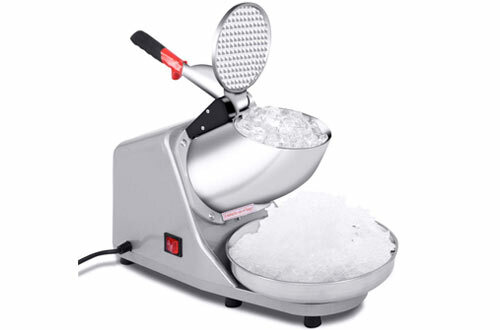 For home or commercial use, the automatic electric ice crushers will make turn frozen treats into a delicacy. This unit is designed to be used on a commercial scale. 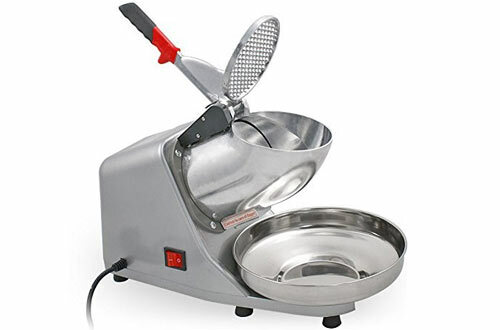 It features durable stainless steel blades that are driven by a 250-watt motor. The blades spin at 1,400 RPM and can easily shave 4 pounds of ice per minute. The mouth opening is wide enough to accommodate large cubes of ice. The crusher comes with a tray that collects the shaved ice. 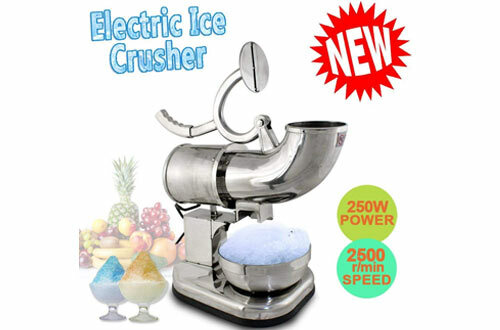 This is a powerful 250-watt ice crusher. It features a shiny and smooth stainless steel construction that gives it a touch of elegance and a feel of class. The crusher is fitted with a set of premium quality stainless steel blades. The blades rotate at 2,200 RPM. The force generated by the spinning action allows the unit to shave 198 pounds of ice per hour. The base is fabricated from heavy cast iron to provide maximum stability. This crusher is CE approved for safe use.